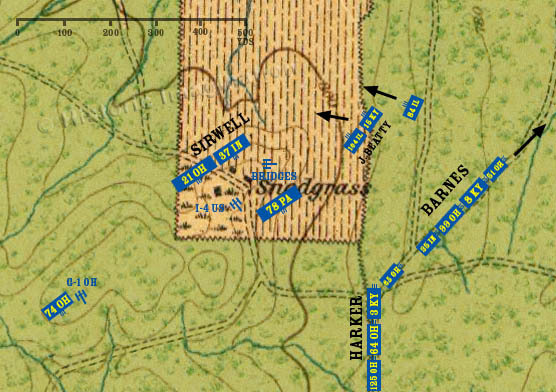 The 78th Pennsylvania takes up a position at the base of a ridge or spur below the Snodgrass cabin. From there it can support the artillery on the spur above and allow the artillery to fire over its head. Refugees from the fight at Kelly Field also begin to arrive. The brigades of Barnes and Harker soon stop along the road while division commander Wood tries to figure out where to go, and what is happening to the south.